Second Life | Art110 – Old Site! Shark Tank… NOM NOM NOM…. I could not come up with a good title so I thought this was a great idea since were munching up ideas during our shark tank meetings. I have to say that I was pretty impressed with a lot of the groups creative ideas in representing their artists’ work. U saw some amazing sketches and ideas being bounced off of one another a lot. All in all, I would say the meetings were successful for most of you because seeing your vlogs I could see a lot of the ideas you had either really stuck or inspired most. I can’t wait to see all of your actual architectures soon! Should be exciting! Hi guys, I graded the 11a class for peeps with last names from A-D. There were many cool chairs and some really thoughtful vids, but I really have to give a big shout out to two peeps who just blew me away: Brianna Bracy and Lupe Cornejo. 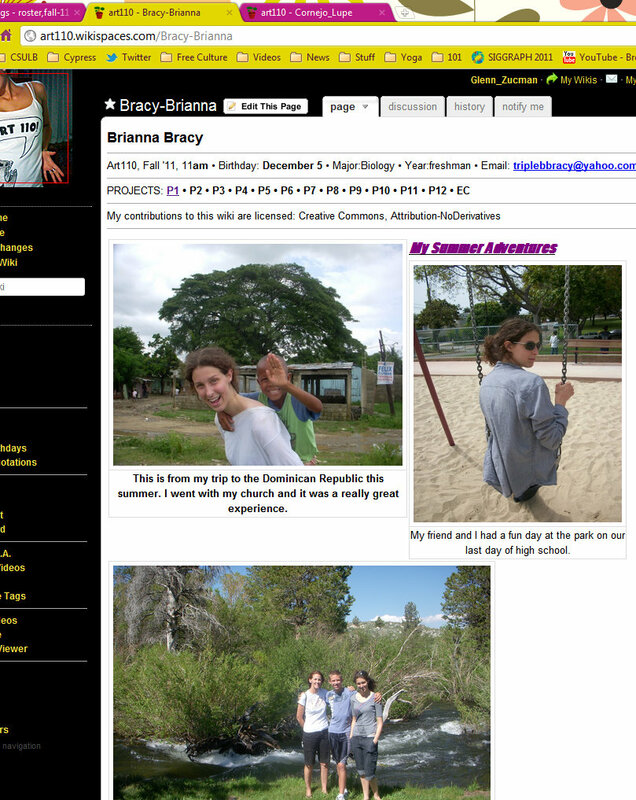 Brianna’s home page is fantastic! I always say your home page is like a handshake at a job interview: sure, you could refuse to shake the interviewer’s hand and if your stuff is great you might still get the job… but why??? Don’t you want to walk into an interview with a smile on your face and a great handshake and immediately make it clear to the other person how enthusiastic you are about discussing the possibilities of working together? The minute I saw Brianna’s home page I thought, how lucky I am to be in a class with this person! The photo of Brianna with the kid from the Dominican Republic on her back is probably the sweetest pix I’ve seen so far this semester. What a gift that Brianna was interested enough in us to share some of her summer adventures with us. Like so many of you, her vlog is a nice, thoughful piece. Lupe’s home page looks totally different from Brianna’s, but it also shows thought, care, and a real effort to get to know us. You really have to read the whole odyssey of Lupe’s chair design. I love that she documented her whole process! Beyond just giving us the one photo we required, she showed us the evolution of her chair and the development of her thinking about it – fantastic! Although I didn’t see anyone in the A-D group do it, remember that you drew those sketches of chairs – I saw a number of really awesome sketches – it’d be so cool to scan your sketch or snap a pix of it and stick it on the wiki. Like Brianna and so many of you, Lupe made a really nice vlog. I have to thank all of you for sharing your thoughts with us and for just plain having the nerve to make these vids. I know plenty of you are shy or private about things, so thank you for giving this a shot. Back to my job interview metaphor, not only will many of you have job interviews in your future but I think all of you will need to present your ideas in many ways to many different audiences. Just as speech and writing classes are so valuable, I hope these vlogs not only help you think about art and ideas, but also make you a better communicator in all the things you do here at CSULB and beyond in your life. Thank you Brianna… thank you Lupe… thank you all! Images of the Bryn Oh Gallery at Virtual CSULB. Created by Nathan Moore, Claire Jeffers, Bianca Harrier, and Kaylin Coleman. 2011.